Iran's president has defended his widely criticised call for Israel to be "wiped off the map". Attending an anti-Israel rally in Tehran, Mahmoud Ahmadinejad said his remarks were "just" - and the criticism did not "have any validity". His initial comment provoked anger from many governments, and prompted Israel to demand Iran's expulsion from the UN. Egypt said they showed "the weakness of the Iranian government". A Palestinian official also rejected the remarks. Tens of thousands of Iranians took part in the rally in Tehran which Iran organises every year on the last Friday of the fasting month of Ramadan to show solidarity with the Palestinian struggle. Shouting "Death to Israel, death to the Zionists", the protesters dragged Israeli flags along the ground and then set them on fire. Many carried posters and placards sporting the slogan "Israel should be wiped off the map". 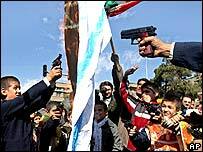 Joining the protest, Mr Ahmadinejad said: "My words were the Iranian nation's words. "Westerners are free to comment, but their reactions are invalid," Mr Ahmadinejad told the official Irna news agency. Some demonstrators wore white shrouds in a symbolic gesture expressing readiness to die for their cause. "Ahmadinejad talks on behalf of all Iranians. We are ready to die for Palestine," Mohammad Mirzayi, a member of a volunteer Shia militia group, told the Reuters news agency. While most Muslim and Arab capitals have remained silent on the president's remarks, a few have spoken out - including Palestinian chief negotiator Saeb Erekat. "Palestinians recognise the right of the state of Israel to exist and I reject his comments," he told the BBC News website. "What we need to be talking about is adding the state of Palestine to the map and not wiping Israel from the map," he said. Egypt, which has signed a peace treaty with Israel, also rejected the Iranian line. "In principle, we are way beyond this type of political rhetoric that shows the weakness of the Iranian government," said an official at the Egyptian embassy in London. Turkey's prime minister called on the Iranian president "to display political moderation". Our world affairs correspondent Paul Reynolds says that the UK Foreign Office does not regard President Ahmadinejad's statement on Israel as a new policy but more as a sign of his inexperience and the very local focus of his government. UK officials suspect that he has held such views for years and that what is happening is that ideologues like him are now in power and are having their views exposed, he adds. While there is no sense that Iran is backing down, there are Iranians who are concerned that their country could become increasingly isolated under this new ultra-conservative government, reports the BBC Frances Harrison in Tehran. Israeli Foreign Minister Silvan Shalom meanwhile said Israel would call for an emergency meeting of the UN Security Council. "We have decided to open a broad diplomatic offensive," Mr Shalom said. So far no action has been taken at the UN, but Secretary General Kofi Annan took the unusual step of rebuking Iran for the comments. Iran has dismissed the international furore as a means of pressing Iran to compromise on its nuclear programme. 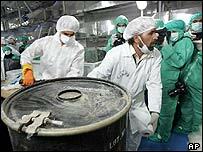 Negotiations have stalled between the EU and Iran over attempts to persuade Tehran to abandon its nuclear ambitions.